There will be 80,000 pre-k seats available by the start of the 2015 school year. CIVIC CENTER — The city is on track to provide roughly 80,000 universal pre-kindergarten seats by the start of the school year and stepped up on-site inspections to make sure participating programs have no outstanding major health violations, officials said at a Thursday briefing. Although the city expects about 70,000 children to enroll in pre-k programs, the Department of Education wanted to err on the side of providing extra space to give parents more choices where to send their children. Various city agencies, including the Department of Health, FDNY and DOE, have performed multiple on-site inspections for all the 1,150 early childhood education centers and 700 public schools slated to provide pre-k starting Sept. 9. There are no outstanding major health violations, city officials said, explaining that they wanted to weed out problems early to avoid a repeat of last year when dozens of programs were either closed or delayed because of safety concerns just before the start of the school year. “We do not allow any program to open its doors unless we are convinced that it is ready for children,” Deputy Mayor for Strategic Policy Initiative Richard Buery said. “Every site that opens its doors on the first day of school is one where the mayor or anyone at this table would feel comfortable sending their own children," he said. Nearly 50 of the 275 new sites that had applied by Aug. 13 and passed the first hoop of the proposal process, were later halted after their inspections. “There is a huge value in making sure that the providers are under the microscope,” Department of Investigation Commissioner Mark Peters said. The city provided an additional $1.5 million to the Health Department to boost its early education and childcare quality control team by 26 inspectors, now giving it a total of 69 staffers. The FDNY now has 55 inspectors devoted to pre-k, and DOE increased its staff at the Division of Early Childhood Education to 326 total, including instructional coaches to monitor and improve teaching quality as well as field staff to oversee each pre-k site. There are still openings at pre-k programs, officials noted. “We have plenty of seats available throughout the city in or near every school district,” Buery said. By having thousand of more seats than anticipated students will give parents the option to switch sites once the school year has started, officials said. The programs will send in their final enrollment numbers to the city in October and only be reimbursed for the exact number of children they are teaching, a spokesman for the mayor’s office said. 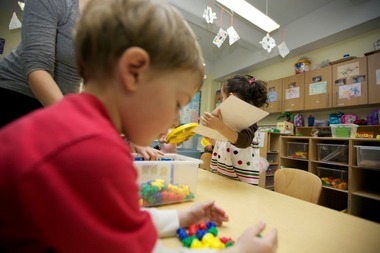 Parents who are still deciding where their child will attend pre-k can use the NYC Child Care Connect database to research program inspection records.